As a very young child I spent a lot of time playing on the streets and would ride any bike I could get hold of… Up and down and in and out of the city streets… I owned the world! Then I was sent to a foreign country for 8 long years. Not only was my right to an education compromised, but I also lost the freedom to ride. Eventually, I moved to a house with a front yard and found a bike one of the workmen had left. I became a hamster on the wheel in that yard. A hamster that was learning big things whilst pedalling to freedom in a small yard! Upon returning to England and picking up any remaining threads of my old life, I explored new hobbies, new friends and discovered a new-found freedom whenever I was outdoors… It opened up space in my neurology to absorb my environment and find out what freedom meant to me and how I could mould it to my advantage with all the new learnings I was acquiring. I eventually got married and had 4 beautiful children. I wanted to give them the same freedom that I had discovered and I encouraged them to ride from a very early age and we became known locally as the ‘bike family’. School run, after school activities, Shopping, etc. was all done by bike. Once the children had grown up and we moved to the North of England, I did a daily ride in the local park. I often heard the locals discussing how I was a little bit crazy mentally and thats why I whizzed around on my bike every day! Having stopped for a rest one day, a lady came up to me and started chatting… She said she envied me and wished she could ride but it was not an opportunity afforded to her in her community. I discovered she didn’t just want to physically ride a bike but also wanted to find the freedom to leave the box she had been hiding in for many years in her mind. I eventually helped her to ride and she grew independent physically and emotionally. She helped me discover a part of myself that loved teaching. As firm friends, Fozia , Najma and myself would often get together for our coffee fix’s and share our discoveries and bounce ideas off each other and we spoke of how we would love to make changes in the world. It was also around this time I was opened up to exploring mind expanding techniques found within the disciplines of meditation and NLP of which I later became a practitioner. 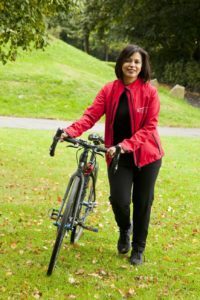 Leading on from this, the opportunity to train as a cycle instructor came along and upon completion we began running women’s cycling groups and discovered a great demand in the community and a deep self satisfaction in being a part of these changes.